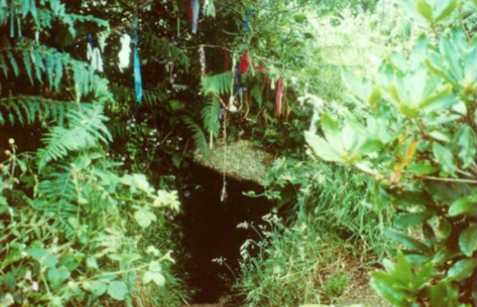 Sancreed holy well lies in a pine and holly grove, and steps lead deeply down into a womb- like chamber, covered with corbelled stone walls and roof. There is now a relatively shallow level of water, though in recent times it was at a much higher level: something seems to have affected the water table, reducing the height of the water. Nevertheless, the water is still clear and cold, and the surrounding moss often shines with a phospherescent glow, giving the whole site a very magical grotto-like feel. The well, which probably originally dates from pre-Christian times, was lost and buried in thick undergrowth for a number of years, but was re-discovered by the Vicar of Sancreed in 1879, and subsequently kept cleared by a Juliette Shanks, who has a plaque dedicated to her on the site. The remains of a early Chapel lie behind the well, with a large 15th century carved stone in one corner, which may have originally formed part of an arch. A modern Christian cross designed in a Celtic fashion stands next to it. hamlet of Sancreed in the centre of the West Penwith peninsula. From Penzance take the A30 towards Land’s End. About a mile past the B3283 turning to St.Buryan you will see a small turn on your right that leads to Sancreed. At Sancreed you can park beside the Church and a public path from the telephone box opposite leads to the well. If you are coming from St.Just, take the A3071 towards Penzance and just past the turn to Sennen take the next right to Sancreed. When you get to Sancreed Beacon there is a large lay-by where cars may be parked. A few yards further on, on the opposite side of the road, a permissive path leads to the well. disintegrated (most materials were biodegradable) so the hurt was supposed to go. Nowadays, the rags are probably hung by people for good luck. Sancreed Church, and thus by implication the well, is dedicated to St.Credan, a mythological saint who in the old texts supposedly accidently killed his father and became a swineherd in penance. Sancreed Church has a carving of him holding a pig above the porch door. In Celtic mythology pigs were totem animals of the Otherworld, and swineherds often have an initiatory significance, representing contact with the Otherworld. Whether a coincidence or not, this legend seems to be particularly apposite at this well that seems to lead down into the Underworld. Holy Wells like Sancreed would originally have been a source of fresh water for people, and came to be venerated for the ‘genus loci’ or spirit of the place who was thought to dwell there. Later, under Christianity, they often became dedicated to saints, and continued to be be vis- ited as sacred and healing places.